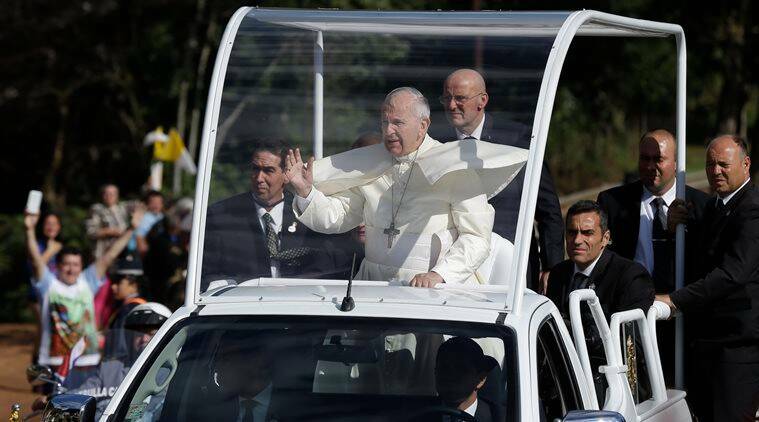 Pope Francis will travel in the Popemobile on streets between the White House and National Mall when he visits Washington later this month, the Archdiocese of Washington announced on Thursday. Spectators won’t need tickets to view the pope as he travels in the special car on Sept. 23, but entrance to the parade route will be first come, first served., according to the Archdiocese. Visitors will have to pass through security and can’t bring in food or drink, but it will be available to purchase inside the secure area, the Archdiocese said. Security gates will open at 4 a.m. and close at 10 a.m. Spectators won’t be able to leave and re-enter until the pope is finished with the tour. The Archdiocese also announced Thursday that spectators will be able to watch live coverage of the day on a video screen set up on the grounds of the Washington Monument. After he visits the White House on the morning of Sept. 23 and travels in the Popemobile, Pope Francis will address U.S. bishops at the Cathedral of Saint Matthew the Apostle and canonize 18th-century Spanish missionary Junipero Serra during a Mass on the east portico of the Basilica of the National Shrine of the Immaculate Conception. He will address a joint session of Congress the following day. Officials said Thursday that the pope’s 48-hour visit to the nation’s capital will have a significant impact on traffic in the city, with extended road closures in areas around where the pope will be. Residents can compare the impact to a presidential inauguration, said James Murray, the Special Agent in Charge of the United States Secret Service’s Washington Field Office. D.C. Mayor Muriel Bowser said the city is ready. The pope is scheduled to arrive in the United States from Cuba the afternoon of Sept. 22 and depart for New York on the afternoon of Sept. 24. He will also visit Philadelphia before returning to Rome. The trip is the 78-year-old pope’s first visit to the United States. The last pope to visit the United States was Francis’ predecessor, Pope Benedict XVI, the pope emeritus, who visited Washington and New York in 2008.